15 Minutes and Three More Stitches?! Adhering madly to my philosophy that a little time for needlework is better than no time for needlework, I’ve made some progress lately using the 15-minutes-for-stitching approach. I’m still plugging along with the Long Dog Sampler I started last year, and since my last 15-Minute Stitching Update, I’ve made some ok progress, I suppose. It’s time for me to switch this project out, though! 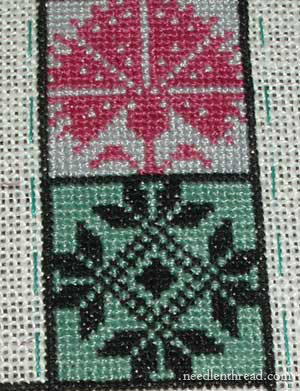 I was supposed to switch it out last week and take up my Schwalm whitework project again, but the truth it, it is much easier to sit down and drop in a few stitches on this sampler, than it is to situate myself with the Schwalm project when I’m in a hurry. I just haven’t had time to do the switch-out and set stuff up for easy access with the Schwalm work, so I’ve stuck with this project so that I’d have something to do here and there, now and then, when the opportunity struck…. … which is, of course, the basis for this whole 15-minute-session idea. When the timer went off, I had three stitches left. But they were significant enough to bug me! That session was a serious Only-15 15-minute-session, as a minute longer and I’d be late for work. So, the timer sounded, I dropped the frame, picked up my books, and headed out the door. I was not “relaxed” or pleased at the end of that session. Three Silly Stitches! For heaven’s sake! When I came back an hour and fifteen minutes later, the timer was still going off. Hmmmm. I decided I would have to take a much more relaxed approach to these 15-minute things if I were to retain (regain?) my sanity. Rushing through the minutes, trying to beat the clock, isn’t precisely the best approach. For the next 15-minute session, I managed to finish those riffemrackemfrickemfrackem three stitches…. … and to work Nine Whole Stitches on it. Twelve stitches in 15 minutes? Perhaps that day, I was a bit tooooo relaxed. Virtue lies in the middle. Next time, I will be relaxed, but at the same time, I am determined to accomplish a bit more than this! How are your 15-minute stitching sessions coming along? I am doing fairly well with my own plan. I am not being so rigid about the time, my objective it so do some stitching every morning before leaving for work and I am managing that most mornings. I find it easier with the bead embroidery than with the silk embroidery. LOL …"riffemrackemfrickemfrackem" … you crack me up ! In my case, 15 min. 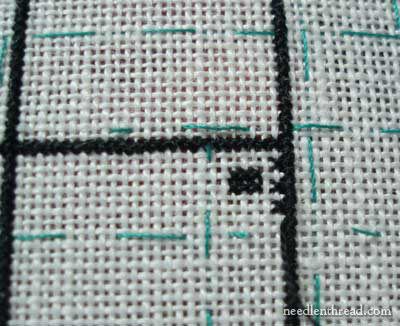 intervals of stitching don't work that well. For me is like taking a 30 min. nap when what I really needed was a 2 hour one, short naps make me cranky ! So what I try to do is push things around in my schedule in order to be able to accumulate enough time ( at least 2 h.) to sit and stitch, even if that means only one long section a week instead of a few short ones through the week. This is the only way I really enjoy and feel refresh working on a project ! Mary- Just curious what thread you're using here? I just visited Needle in a Haystack and was overwhelmed by the options. Yes, I agree on the nap theory and the hours of stitching theory. I have decided to subscribe to them both, at least once a day, but more if necessary!!! CA – I saw your beads the other day – a magnificent project, and I can see how it would be worthwhile to be 10 minutes late for work, for that last inch o' thread! >:-) But hey, don't let me be a bad influence! 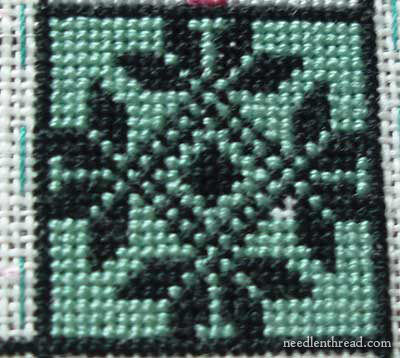 Cynthia – I'm using regular DMC stranded cotton embroidery floss, which you can buy just about anywhere that carries needlework supplies – including fabric stores, etc. I use the 15 minute rule for most things in my life. I have a bunch of timers around the house to keep track. I clean each room for 15 minutes on cleaning days. I exercise for 15 minutes at a time. 15 minutes of reading. 15 minutes of stitching. It goes on and on. And hi…I just hopped over here from the Floss Queens blog. I am trying to squeeze in 15 minutes a day. And feel great when I do. Breaking things down into steps and allocating a little time rather than having to find a lot of time helps me keep going on a project. If I think about the whole thing and how much there is to do, I will just not do anything but if I tell myself to do one thing and just think about that one thing I can do it. What a lot can be done in 15 mins. Yeh right. I had medical appointment this morning, there was only 1 letter, veins on a leaf and a row of chain stitch leaves to do on a prim naive sampler I am doing, 15 mins should cover it easy. Made the mistake of not setting the timer, 30 mins later rushing round in a mad panic cos I am going to be late, just four straight stitches to do on one leaf, one leaf – 4 stitches, can't find the thread I need, it was there before, can't substitute – its for a magazine article. Rush rush rush – leave it, I've got to go. Quickly throw the neglected washing into the machine (I knew I should of done that before I started stitching), check my appointment card before I jump in the car – OOOOOps. Appointments tomorrow not today.